“It’s an wonderful feeling when you guys are around. You make me feel important, happy and you know when to leave me alone. I will never leave this group ever in my entire lifetime.”, one leaf said to it’s fellow branch-mates while enjoying the pleasant breeze of spring. At times some of them are dancing with excitement but nobody following a specific pattern of dancing. But together if you see it looks like a great dance form. Some new leafs of the branch are little hesitant to dance in front of the seniors and while seniors are dancing carelessly. It looked like a perfect concert and wind was in favor of this arrangement. A sudden blow of wind from south came and took the oldest leaf ‘Jay kaka’ away even before anybody could realize. Wind stopped in few moments and gave the time to the concert group to realize the situation. The youngest of all leaves shouted, “Hey where is Jay Kaka?”. Everybody looked around and could not find him anywhere. Then one leaf from the top branch said, “He flew away with the wind. I saw him hitting the ground several times, then the mountain, stuck in the mango tree for a while before he went out of my sight”. All wore a very sad face thinking about the fate of oldest leaf of their branch, Jay kaka. But continued slow breeze of spring inspired them to restart their concert forgetting the loss except Jitu. Jitu is now the oldest in the group. He is not as old as Jay kaka was but he is not too far away as well. He continued to think about the fate of his beloved Jay kaka. He could only think of horrible incidents that might have happened with him. Gradually others in the group pulled him back to the concert and he continued. But the worry remained alive. Time passed by and the spring was almost in the middle of its age. Leaves were growing old with time. Their wrinkled skin and losing fairness was making them think about Jay kaka more often and were scared of their fate. Once again a sudden wind came and all leaves started shouting together, “Shhoooooonnnnnnnnn, hold on to your connection guys, this time will pass soon, do not panic and move, we all love each other and our togetherness will help us. Hold on to your roots guys. Hold on to your roots. Shhooooooooooooooooonnnnnnnnnnnn”. This is something they learnt from their seniors. They say this when there is a heavy wind. Suddenly Jitu felt a strange lightness in his body, something different and pleasurable, He had closed his eye to avoid the dust get into the eyes as instructed by its elders but he felt like opening his eyes and experiencing the lightness better. The moment he opened his eyes he could not believe what he was witnessing, he immediately closed it again out of fear. After few moments he dared to open his eyes and saw a big open ground underneath and he was about to touch the ground. His heart beat almost stopped but after touching the ground he got another wonderful feeling, Wind started dragging him on the ground and could see beautiful dust waves accompanying him. In few seconds, he was again in air for a while and fell on ground. He started enjoying this bouncing act. He started singing his favorite song while dancing to the tunes of the wind. he looked up to see his friends in the tree. Another big blow came and took him to the river nearby. He was scared to touch the river because rain waters were painful for him so he always hated water. But the moment he touched the river his all fear went away. He started enjoying the waves and he joined the fishes and other floating friends. A wonderful experience beyond explanation. he decided to keep quiet, float and enjoy the feeling. He closed his eyes and started feeling it better. After a while a known voice came from the river bank, “Jitu, enjoy your trip. One life is not even enough to have all fun that you can have. Every moment it is more interesting becaiuse of the challenges. Do not waste time worrying. Feel the moment, join the laughter and fear none. Good luck.”, Jitu opened his eyes to see it’s Jay kaka resting on the banks of the river with some of his similar aged friends. And he was happy. 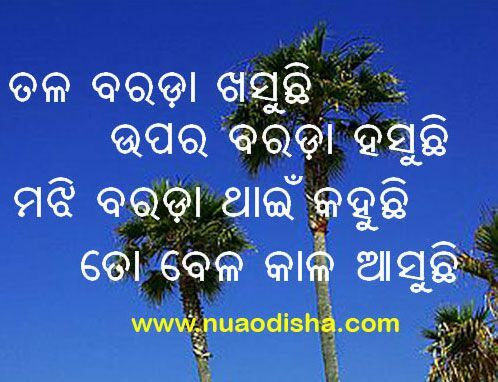 Meaning: The old leaves (lower section) of a palm tree are falling, The youngest leaves (Upper section) are laughing, the middle ones are telling that my days are coming.